Creation Wines wine paring is always a wondrous experience! Not one word of a lie! On arrival I am always struck by the beauty of the setting. The eclectic art scattered around the garden seems to try to prepare one for an otherworldly experience. We were greeted and taken to our table with sincere warmhearted friendliness by the lovely Vernė Janke. The atmosphere, as always, was relaxed and welcoming. Chattering guests and efficient waitrons lit up by the most beautiful soft September spring light. It would be hard not to feel blessed at moments like these. We settled in, were brought the quaintest little footstools for our bags and then our well informed host, Warren Wolmerans, came over to introduce himself. What a delightful person! We did not even know in what good hands we were yet! We got spoiled rotten. I have never had a problem with that. 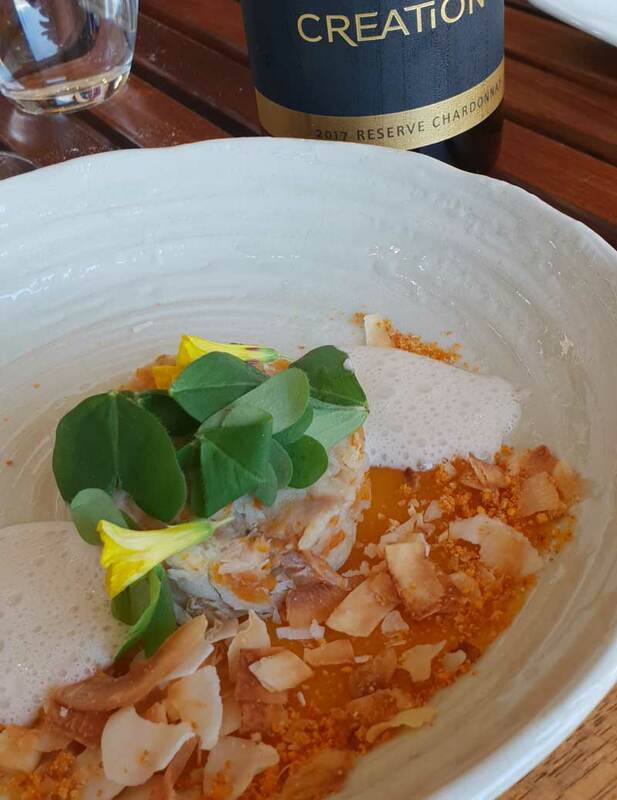 Some sparkling water, our Umxoboti beer bread, miniature Cape seed-loaf, Apricot butter, Goat cream, Dukha and ice cold Elation MCC 2014 was served almost immediately, much to our delight! The combinations all sang love-songs to one another from aromas to textures to flavours. 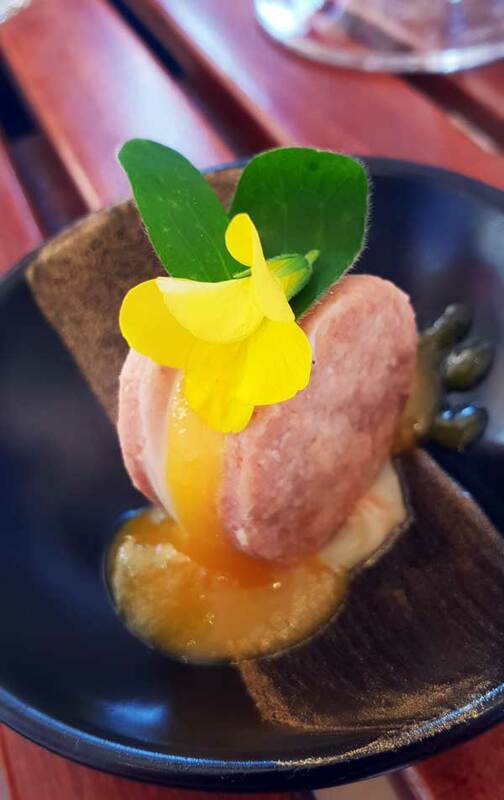 The story continued with an amuse-bouche of Passionfruit yoghurt mouse, apple, fennel and Nasturtium served with Creation Sauvignon Blanc 2018 . The wine beautifully complimented the almost quirky, creative food. The combinations truly dance on your tongue and one almost does not want to swallow but when you do, the flavours linger and elongate the pleasure. The crispy passion fruit crackling perfectly balances the soft mouse and the aroma of the wine just declares unconditional love to the pallet. Our energetic host kept appearing and disappearing right on cue. He offered wonderful insights into the food and wine without being intrusive when my friend and I were in deep conversation. His endearing passion for Creation Wines shone through every word. In fact, every member of staff at Creation displays a genuine love for and pride of the place, its owners and produce. I really like that! It makes one feel at ease and at home in stead of feeling like a burden on their time. Au contraire! 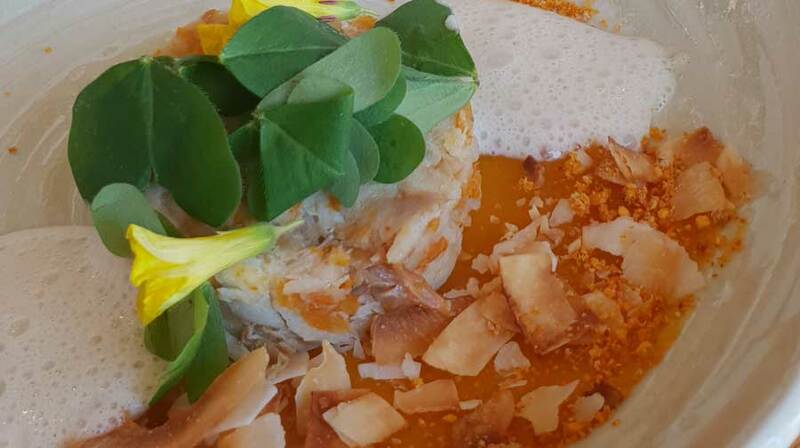 Smoked snoek, Apricot, Peach, Coconut, Sorrel served with Creation Reserve Chardonnay 2017. The consistency and textures of the food was most complimenting, especially with the surprising element of the crispy coconut shavings. The wine has a nose filled with glorious layers of sun-kissed pear and peach which is enhanced by a fresh minerality and a hint of vanilla. The most pleasing and full-bodied palate is in perfect harmony with the the fruity, subtly spicy atoms orbiting the gently balanced acidity. 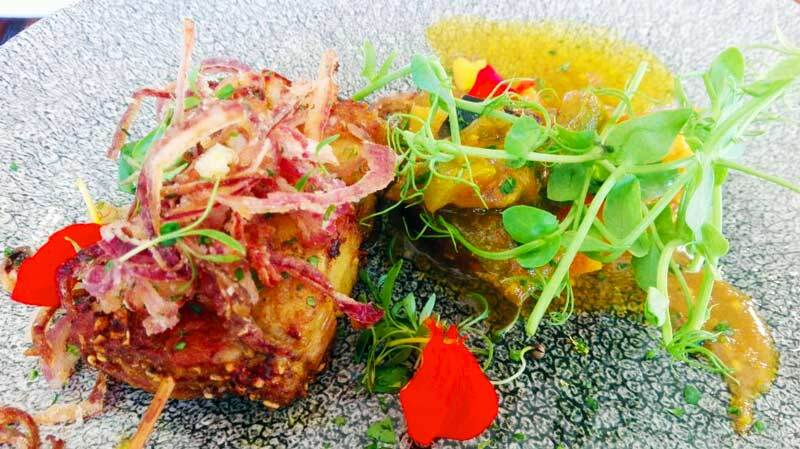 Exotic mushroom, Onion, Truffle, Potato, Oregano served with Glass of Creation Reserve Pinot Noir 2016. 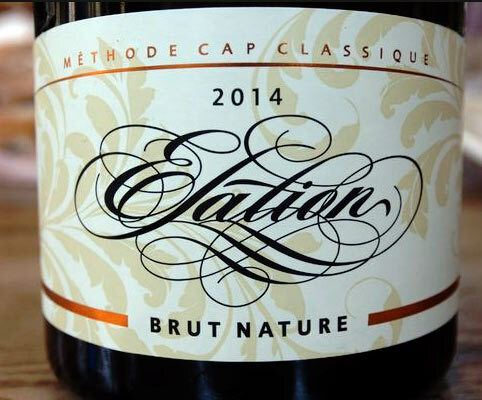 This is one of my favourite wines of Creation – hard as it is to favour any of their excellent wines. It is like participating in a bouquet of spice! Peppercorn and clove and then a twist of a delicate whiff of apricot. It is a very smooth and complex wine with layers of dried fruit, raspberry, cherry and an almost cheeky and appetising piquant spice. Our spring-resembling plates of Lamb loin, Gremolata, Jus, sprinkled with Violets arrived and it was so beautiful to behold that only my curiosity to taste it could get me to disturb the arrangement. How many times can one use the word delightful in on article? The accompanying wine was Creation Reserve Merlot 2015. This wine is a as smooth as a happy baby’s cheek! It is complex and with clear aromas of berries, nuts and a most delicate smoky whiff of cedar and clove. With the level of bonhomie at this stage, I might have been happy with a piece of bark, but then the Curry Dukkah, Pork belly, Atchar and Coriander dish appeard from the kithcen and we were smitten once more. It balanced perfectly with the glass of Creation Syrah, Grenache 2017. Alluring aromas of ripe black olive elegantly complemented by whiffs of pepper. This is not a shy wine! It is a full-bodied Rhone-style blend with intense flavours of ripe plum, black pepper, tapenade and that elusive, delicious umami. It took some dedication to convince my belly that I could fit in more divinity, but when the elegant portion of Almond shortbread, Namelaka and Gooseberries decorated with fresh Sorrel flowers arrived, I had to taste it. Once more it was a perfect partner for the heavenly Creation Viognier 2018. Its tongue-tingling acidity walks a tightrope with elements such as apricot, peach and coconut. All in all, this was an experience I shall not forget. 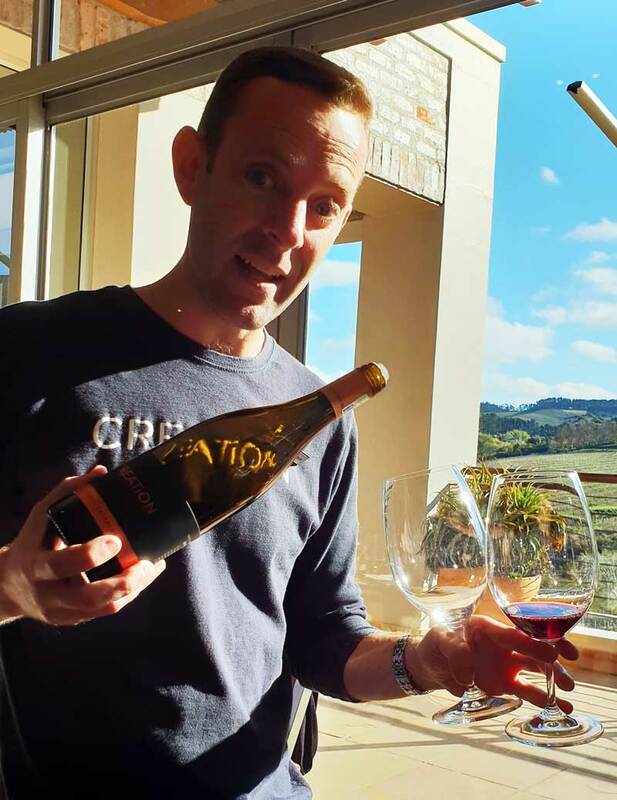 The seemingly effortless exquisiteness of everything at Creation Wines makes a decision to spend time and money there a no brainer. Every time! 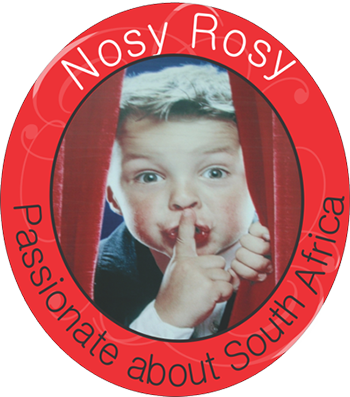 We love to feature the shining, innovative, creative, hard-working initiatives & members of our Rainbow Nation.Nosy Rosy is Passionate about #SouthAfrica #Life, #CapeTown #Overberg #WestCoast and the best #accommodation #food #wine, venues, shops, festivals, communities of all our areas.